Scenes are change through action in conflict within a certain space and time. Crisis questions are the dilemmas that force your characters to decide and act. Listen to episode 120 to find out how to make the most of these scene elements. Character reactions shouldn’t be random, but based on the way people actually respond to stimulus in their lives. Listen to episode 115 to find out how to craft great scenes by focusing on motivation reaction units. To get the most from hiring an editor, you’ll want to tackle certain tasks before you pass on your manuscript. There are plenty of steps you can take to improve your story so that your editor can focus on deeper issues and help you tell a great story. In this episode, fiction editors Leslie and Clark critique the prologue and first chapter of From the Flame, a fantasy novel by Kristen Franklin. They discuss where to begin your story. If all the events of the protagonist’s life were laid out in front of you, which is the most powerful moment to use for chapter one? Hire Clark for your developmental edit! Click here to find out more or email Clark. Find an illustrated guide to writing scenes and stories here. Editorial Mission—Where to Begin Your Story? Look at your story as a whole and consider where the protagonist is starting and where she ends up. What are the events that lead up to what happens in the story? Have you shown enough of the ordinary world to allow the reader to perceive the impact of the inciting incident? Have you started too early? Thank you so much for your submission. Helena is an intriguing character, and the opening of chapter one has me quite curious about her coming adventures. We expect princesses and queens to be trained in certain skills, but these don’t usually include combat and spying. This is a lovely twist that tells us that Helena isn’t a standard potential princess that we’re used to seeing in fantasy novels. We have some suggestions that we think might make the opening stronger, but I want to preface this with a couple of caveats. This is an early draft, so you hadn’t had the opportunity to review the opening in light of how it ends. The beginning often changes dramatically once we get a better idea of what we’re writing toward. It’s tricky to make suggestions about where to start, especially when we don’t know what follows, and prologues often don’t make sense at first because the reader is seeing events or characters out of context. Please consider our suggestions as representing options to consider. 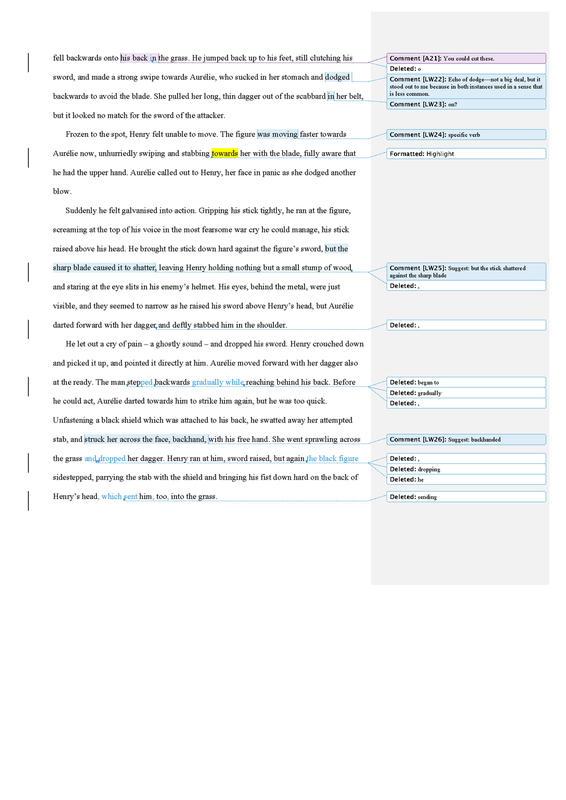 An editor reviewing your story would read the entire manuscript and understand how the events in the prologue fit. The History of the World portion of the prologue didn’t seem critical at this point. It was a lot of information when we don’t yet know what’s important. If you refer to a time before the fires without explaining it, you create mystery that can pull the reader forward. It’s tempting to give the reader an explanation of the world when it’s unfamiliar to them, but consider waiting until the facts can provide the greatest impact, where its revelation will bring the protagonist closer to or further from her goal. Readers know they are entering a world different from their own, so you have the luxury to reveal your world strategically. In Helena’s portion of the prologue, I didn’t feel as pulled into the story as I would have liked. Much as I love Helena as a character, I didn’t feel fully engaged with her until chapter 1. That’s when we get a characteristic moment in Helena’s ordinary world that is moments away from an event that could throw her life into chaos. We see her engaged in an activity she loves and we hear about her training. We also know about the big event to come, which raises all sorts of questions in the reader’s mind. The prince is supposed to choose his future wife, but will he choose Helena or someone else? He could flat out refuse to choose. Some other event could happen that changes everything. These possibilities make for a compelling opening where we’re eager to find out what happens next. Again, this is something to consider in light of what you know about how the rest of the story unfolds. Thanks again for your submission, Kristen!